Following NARAL’s how-to manual, Unmasking Fake Clinics, a serious assault has begun on pregnancy help centers in a number of locations around the United States. This guidebook is very clear about the reason for these attacks. Evidence of the strength of the CPC (Crisis Pregnancy Center) movement is drawn not only from their growing numbers, in connection with anti-choice organizations, but also from their enhanced credibility. It is clear that these women helping centers are robbing customers from abortion mills all across the United States. In state after state we are hearing reports that the number of abortions has and continues to drop. In some states the decrease is as high as 50%. The pro-abortion industry has done its best to discredit what they call fake clinics. To date their campaign has been strikingly unsuccessful. During this time, the pregnancy help centers have grown in numbers and have grown in influence and sophistication. A particularly good development, in the last few years, has been that many of these centers are turning themselves into full-service medical clinics. The centers are acquiring ultrasound machines and the technicians to run them. They are staffing them with, or becoming affiliated with, licensed medical personnel. Their help for women is better known as a result of advertising more widely, in some cases on TV which has been very effective. The pro-abortion industry and media have continued to paint the right to life movement as an isolated minority group, characterized by religious zealotry, violence etc. Apparently, not much of this has rubbed off on the CPCs. Their reputation has only grown more compassionate. One recent thrust is the national push to publicize the slogan Love Them Both. This has helped to counteract pro-abortion propaganda assaults. New York  In January, New York Attorney General Eliot Spitzer declared open warfare against pregnancy help centers in his state. While he has been known as a pro-abortion advocate, even speaking at NARAL’s meetings, this attack can only be described as bigoted and vicious. It took the form of subpoenas issued against a long list of pregnancy centers. He accused them of practicing medicine without a license, and many other improbables. His subpoenas demanded nearly every piece of printed paper that had passed through those centers in the last two decades. It was quite obvious that his intention was to close them down if possible or bankrupt them. Without question, another reason was to intimidate the thousands of sincere volunteers who operate these centers, in the hopes that they would withdraw out of fear of legal harassment, and leave the centers without staffing. The Attorney General of South Carolina almost immediately issued a statement strongly criticizing Spitzer and accusing him of pro-abortion motivation without any substantive cause. A national coalition of pregnancy help centers issued an open statement, condemning the attacks as unwarranted and as a thinly veiled attempt by the pro-abortion industry to eliminate competition. Several major religious figures weighed in. Then the heavyweight legal defense firm, The Christian Legal Society, entered the fray, as did the legal counsel of many of the centers themselves. On February 14th, The American Center of Law and Justice filed a motion in the Supreme Court of New York to quash a subpoena issued to the Manhattan offices. Two weeks after the centers initiated legal action against him, Eliot Spitzer announced an agreement with a center in Victor, New York. With this he revoked the subpoenas issued to the other centers across the state. In a clear retreat, he stated that the agreement he has reached will clarify acceptable practices for the centers. Time will tell, but it seems that the agreement is modeled closely on consent degrees that had been mutually agreed upon after a similar assault on the Manhattan centers by previous Attorney Generals in 1987 and in 1995. These will put quite a crimp on the centers, if in fact they are rigidly imposed. They include informing women that the center does not perform abortions or refer for them. In the event they are not staffed with medical personnel, the centers agreed to disclose verbally and in writing the fact that they are not a licensed medical center and not qualified to diagnose or date a pregnancy. Also, the on-site pregnancy test would be done by the woman herself, not by the clinic personnel. The last word has obviously not yet been spoken. When clandestinely visiting a CPC, NARAL suggests the person call for the appointment from a blocked number and be ready to tell them when your period is due. Be prepared with a story. It warns its investigators to be on the lookout for a lot of talk about God, the physical dangers of abortion and the so-called post abortion syndrome. It gave questions and answers, instructed them to closely survey the center and bring that information back to a pro-abortion center. CARAL (California Abortion Rights Action League) is attempting to paint CPCs as though they are part of a huge national conspiracy. Most CPCs are telling their pro-life volunteers, if they are doing the job that they’ve been trained to do, they have nothing to worry about. The centers serve women and will continue to do so, including those who may come under false pretenses. 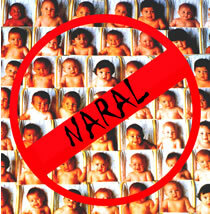 This entry was posted in NARAL by Dr. John C. Willke. Bookmark the permalink.